Who is it for? 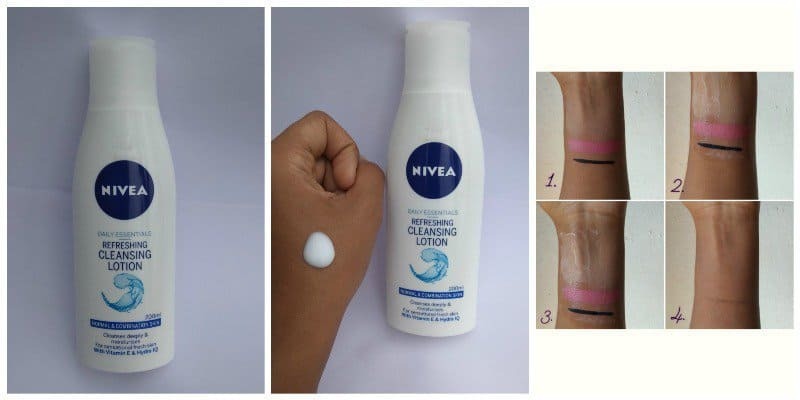 Nivea Daily Essential Refreshing Cleansing Lotion is a cream based cleansing lotion for all the ladies having normal to combination skin and like mild cleanser which cleanses and moisturizes. Also does not dry out the skin. Take a coin size product and apply it in your skin by gently massaging in a circular motion to face and neck. Remove the product with a cotton pad then rinse with water. Pat dry with a towel. It comes in a regular squeeze bottle, white in color. The necessary product information is labeled on the bottle. The lid shuts tightly, making it spill proof. It is very travel-friendly. The fragrance is very strong but it does not last after rinsing it off. It the classic Nivea fragrance, which is a bit overwhelming. It looks like a regular lotion which is white in color. It is of heavy creamy consistency yet a little runny. It spreads easily on the skin. I have been using this cleansing lotion for a couple of years now. It is a cream based cleanser which is mild on the skin and works effectively. It contains Vitamin E and Hydra IQ which is Nivea’s secret hydrating formula. This cleanser is a part of my daily skincare routine, I use it at night time to cleanse my skin. It removes all the impurities and makeup. It does not sting the eyes while removing eye makeup. It leaves my skin soft and moisturized. It does not dry out my skin nor does it cause acne. It is very easy to use and spreads evenly on the skin. Will I repurchase/recommend this product? Yes, I would definitely recommend this product. The product does what it claims, affordable price and great for the daily purpose. Lotus Herbals Lemonpure Cleansing Milk – Should You Buy This ? Nivea products are quite effective and affordable.. Hope this one gets launched in India as well.. I am glad to know that you liked it! A worth buying product. All the more when the winters are round the corner and you need the best product to take of your skin. It’s fragrance is not so mild and also keeps my skin moisturized for a longer time whichs me purchase it without hesitance. Keep going @Binisha chakhun 💓. Looking forward for more reviews to come across your way.